2P START! Live! 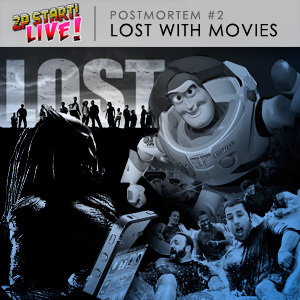 : Lost With Movies | 2P START! Find out what’s new with Tim and Ray as they talk Toy Story 3, Predators, LOST*, Grown Ups, Step Up 3D, Inception, Twilight, Piranha 3D, and bad movie trailers! Plus iPhone 4, an old lifeguard story from Ray, and much more! *If you don’t want LOST spoilers, we tell you how to skip it all safely during the show. I’ve never watched lost but I’ll listen to you talk about it cause i miss you’re voices. It’s like missing an old friend. We’ll know how much I can understand your LOST talk without watching an episode of LOST. SWEET!!!!!! I wouldn’t have been able to watch it tomorrow, but uploading it THIS EARLY?! This is great!!!!!!!! Daecious pretty much summed it up for me. I’ve seen none of the things you talked about, but it was still fun to listen to. With E3 and Lost out of the way now, I’m not sure what you plan on talking about next time, but it’s good to know you at least plan on having a next time. Hey Ray, what did you think about the Pixar short: “Day and Night”? That was some of the coolest 3D I’ve experienced and a great concept in general. Each character acted as a window into a different world! I almost ate a fly sucking in the excitement-air-gasp for this! I do understand and to an extent agree with your frustrations about the number of questions that didn’t get answered. Some of the ones you mentioned are less important ones to me than others (Case in point: the Egyptian hieroglyphics. That was there only to establish that ancient civilizations had discovered the island in the past. What happened to them is not a big deal in the grand scheme of the show, Ray.) I agree that some more explanation about what the Smoke Monster was and how his escape would have been bad would have made the finale immeasurably stronger. That said, I also think the way the show ended was very true to its postmodern, spiritual-without-specifics, ambiguous nature. The show repeatedly touched on ideas and theories such as destiny, free will, good, evil, higher powers, etc. without ever stating its own position apart from a vague spiritualism. In a sense, the show is about seeking answers in life and making do with whatever theories or conclusions we draw for ourselves, much like the way the producers seem determined to leave much of the show’s mythology up for interpretation. That becomes frustrating as those of us who were looking for definitive answers as if Lost was a John Grisham-style conspiracy novel slowly realize Lost was really more of a philosophical fantasy tale ala Lewis Carroll. From the writers’ perspective, the point wasn’t the destination, but the fanciful/insightful ruminations along the way. So yeah, frustrating, but internally consistent. I’ll say something quick about 3-D and then I’ll end this lengthy post. I’m with Tim on this one. I’ve yet to have a 3-D movie experience that’s convinced me that it should become a part of moviemaking’s future. The 3-D in Avatar did nothing for me, but that may have been because I was too distracted being annoyed at the one-dimensionality of that movie’s characters and plot. 3-D is best saved for amusement park attractions, in my opinion. Ok, I’m done. Sorry for the long post. Hope to hear from you guys sometime next month! The only comment I have towards the Lost discussion regarding the “missing answers” is something the writers mentioned: you don’t want to give people “midichlorian” answers. In Star Wars, people were satisfied with “the Force” being this mystical thing that wasn’t explained. When Lucas threw in midichlorians as the reason people could use the force, people rejected that explanation because they didn’t need an answer and it wasn’t satisfactory. So things like “why did the Man in Black turn into the smoke monster when he went into the light?” being answered might actually be less satisfying than remaining open. A little while back Angry Joe reviewed Avatar, he claimed that he took off the glasses and that a bunch of scenes didn’t even have 3D effects in them. I had to agree with lot of things said on the podcast. Toy Story 3 was amazing and I had heard that the ending made some people cry and that they would end the third one so that a fourth one would not be made ….so naturally when they were hurling to their death by fire I was thinking that this was going to be the end…and I was so freaking scared…All I was thinking was NO, they wouldn’t….they cant…there’s no way…kudos to pixar for making a cartoon that suspensful. I also loved the Lost discussion! I hadn’t even given thought to some of those unanswered question that you guys brought up. I’m so excited for your new album, Ray! I’ve been listening to Pixel Vision a lot the past few days and I love it. Avatar was disappointing, I still haven’t seen Toy Story 3, and Inception I’ve heard is amazing, but it reminds me so much of the Matrix it looked completely unoriginal, but apparently it’s really good. Twilight, just bad. Especially the books. Bad bad pointless stories. Okay, LOST I agree was disappointing. And all the Egyptian stuff! My math teacher and I had intense theories about the hieroglyphics. Richard Alpert is R.A. is Ra is the Egyptian God of life and death, they definitely could have gone somewhere with that! I think the writers might have done a lot of making it up as they go. I think the series has gotten worse in it’s later years. I liked the first seasons the best. Good show. Skipped the Lost part because I wouldn’t have even had any idea why you were talking about. I don’t have any reception issues with my iPhone 4 either. Toy Story’s near-death scene was great. But I sorta figures what would happen. I was sort of surprised there was nothing about Despicable Me- that was a fantastic movie and seems like something Ray would see. Great podcast. Always interesting to hear your guys’ thoughts on stuff. I already ranted about The Last Airbender in the forums a bit, but yes, I do think that, like the Twilight movies, the first is the worst and hopefully it will get better. Now, I’ve only seen the latter franchise because my wife is a fan; just so there’s no confusion out there. We saw TLA and Eclipse practically back to back and my wife asked me which one I liked more. I tried to say Toy Story 3 was my favorite but since it wasn’t part of the question that was vetoed. So I had to admit that of the two, Eclipse was the one that actually felt like a movie, and not some on-the-fly rehash of the source material. With regard to Toy Story 3… it was awesome. Probably would have seen it in 3D but our concern was ‘we are at the mall now… what’s playing soon?’ so ended up in good ol’ 2D. I could not have imagined a better way to make that movie. It really had me going at the end, too, because you see that acceptance on everyone else and eventually Woody as well. And that’s the point where I realized, yeah, they could end it that way. Afterward my wife said she was never fooled. She’s a spoil-sport like that. When I later began perusing Wikipedia for information about TS3 I was surprised to find out that Andy was once again played by the same kid that played him in the first two films (he’s now 25, and so, not a kid any more). I thought that was pretty cool and that makes me like the film even more. I’m also looking forward to a repeat viewing because I hadn’t caught the fact that the garbage man that picked up Lotso at the end was actually Sid; the kid that I’m sure was scarred for life when the toys came alive in #1. Sid’s actor also reprises his role, by the way. Fun! Last but not least, Lost (alliteration much?). I pretty much agree with a lot of what you already said. I think I was disappointed by the ending because I thought I was watching a science fiction show. Of course, it was foolish of me to think that in the first place, but so be it. Anyway, I imagined my ending of the show a little bit differently; of course, it would have involved the flash-sideways actually being a flash-sideways where everyone wakes up in an alternate reality and, most importantly, is alive. Sadly, that is not meant to be. Then again, I’m not sure how I expected such an idyllic scenario out of Lost to begin with. Oh, and regarding the iPhone issues, somebody at my work has an iPhone 4 and is left handed and he said the way he naturally holds it sometimes he’ll just stop getting any data if he’s online or something…I’m not sure about calls, though. Second Child??? If it’s a boy, name it Devin. oh god no, Devin is NOT a cool name to have. Congrats on the second, Tim and Sarah! Also, congrats to Tim and Ray for making me shed my second tear on account of 2P START! – the first, after listening to podcast 124 and realizing the comic really was ending; the second, here, from laughing so hard at Ray’s lifeguard story. Hey Ray, you now they planned on killing Jack halfway through the first episode? In order to surprise the audience and make sure no one new what to expect watching this show. They decided against it because they thought he was too good a character. Heh. I love the trailer bashing. You know a movie is REALLY bad when the trailer is bad (expect Alpha & Omega to epic fail!). But yeah, having bad movies with good trailers makes me really jaded about trailers too. Currently in that conundrum with the only movie I really have my eye on now, Legend of the Guardians. As far as I can tell, it may live up to its potential, but the excessive focus on “epic story” in the first trailer has me worried they might not have a good story flow setup, and might also have some stilted character development. Not to mention they seem interested in proclaiming it’s by the people that did Happy Feet, which is already dubious (I consider Happy Feet the worst of the “critically accepted” animated movies). Yes! Even though you’re not doing any more comics, we still get podcasts. I couldn’t be happier that you decided not to abandon your fans completely, and kept this site alive. Great podcast, as always. I’ll check back every day to see what the best webcomic site EVER has in store. Just been on holiday (vacation for you guys!) for 2 weeks and saw this today when I came back! Listening to it while posting! And right when when I’m about to click on ‘Submit Comment’… A second child! Congrats, mate! January? My sister’s birth month. Nice listen! Tons of laugh out loud moments–just what’s come to be expected from you guys. Toy Story 3 was great indeed. Agreeing with Tim on how the furnace scene was probably the most intense scene of any movie I’ve ever seen. I think the other guy didn’t die when he came out of the temple because a Walrus with a top hat and a spectacle appeared and gave him special powers so that he wouldn’t die. And then they went on their merry way. You guys should make postmortem comics every once in a while. it’d be nice for one even only every once a year. i think there is something wrong with the podcast,i can only listen to the first 15 minutes,why cant i listen to the rest? I just listened through your Podcast and noticed that you mentioned me and the website 🙂 ! I JUST FOUND OUT THAT THE 2P START LIVE OPENING AND CLOSING SONGS ARE FROM FIGHTERS MEGAMIX!!!!!!!!!! this probably might have already have been said, but oh well… is this a bad time to rise from my grave too?